As I said in yesterday’s post, we shared between the four of us two bottles of sparkling wine for breakfast on Easter Sunday. The ARRAS as well as the MONSIGNY are award winning wines. They made a terrific start to the holiday. 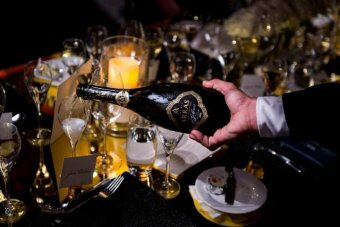 “A Tasmanian sparkling wine has made history by being named Champion Wine at the National Wine Show of Australia. It is the first time a sparkling wine has won the overall champion title, taking out the Len Evans Memorial Trophy for Champion Wine of Show. The winning drop, a 2006 House of Arras blanc de blanc, is a 100 per cent chardonnay wine.